The idea builds on the concept of ‘re-amping’. Traditionally, bass has been recorded directly to tape or hard disk. 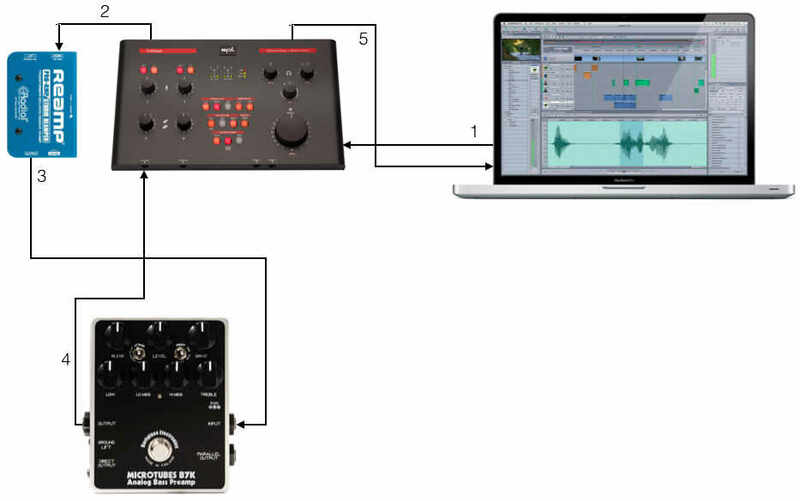 A common setup in the studio is to use a DI box or a direct input on the mixer or audio interface if there is a dedicated instrument input channel. However, many producers like the sound of cabinet speakers, so it has also been fairly common to then send the recorded bass track to a bass amp and a cabinet. Then the cabinet is recorded through one or more microphones in the room. At the end of the day, the best results often came from mixing the direct line signal that was originally recorded with the ‘re-amped’ track. I use a similar setup when capturing the sound clips in the reviews on bass-pedals.com. Radial Engineering makes a dedicated DI box that is designed purely for reamping. In fact it is simply called REAMP. What it does is simply to take a high-impedance line signal coming from an audio interface and convert it to a low-impedance instrument signal. It is a completely passive box, so you don’t even need to power it and it does the job perfectly. Since I don’t use amps, I usually refer to the concept as ‘re-fx’ or ‘re-pedal’. 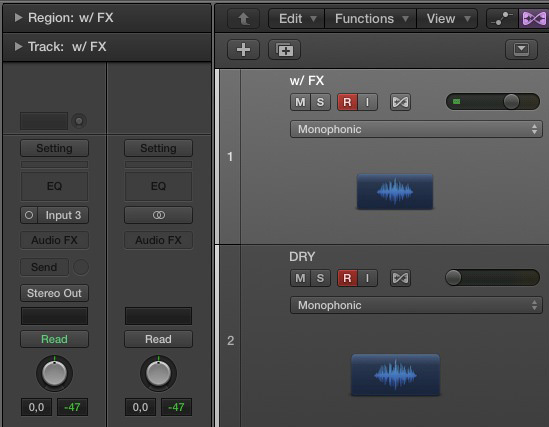 I use an SPL Crimson audio interface and Logic Pro on a Mac computer, but you could use any audio interface, DAW and computer to create a re-fx setup. The only additional thing you need is a device for changing the impedance such as the Radial REAMP. 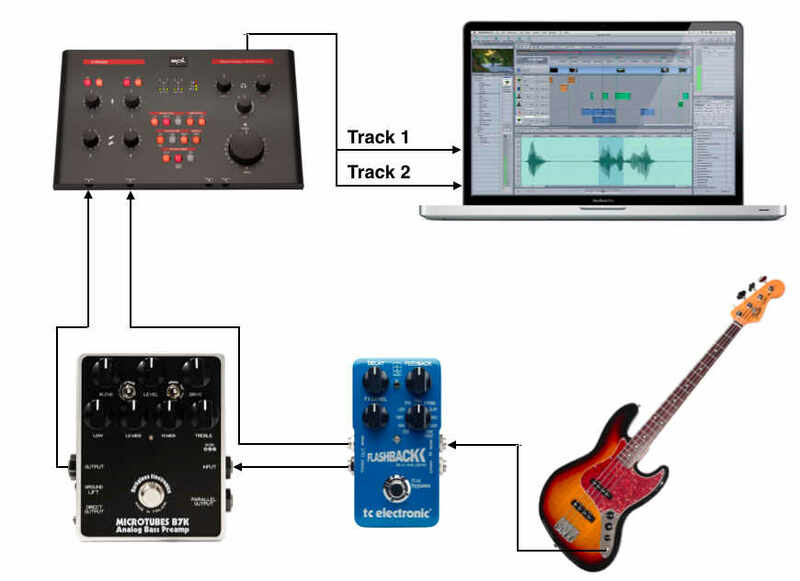 So, why not just record with the pedals and effects that you want to use anyway? Sure, you can do that and especially if you have a preamp pedal that just gives you the basic tone that you want, it makes perfectly good sense to just record through that. 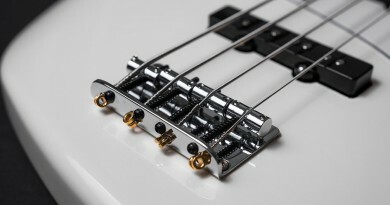 Often, however, you may not know exactly what sound you want before you start recording and capturing the raw tone of your bass gives you a lot of flexibility. As mentioned, basic tone-shaping may be fine to capture, but say you want to use compression or modulation effects, these are impossible to remove upon recording. It’s much easier and more flexible to add effects afterwards. 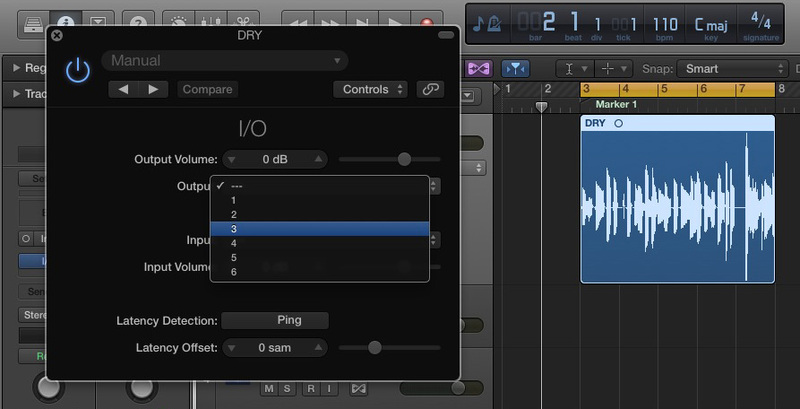 You might argue that you could simply use plug-ins for that, and that is absolutely true. 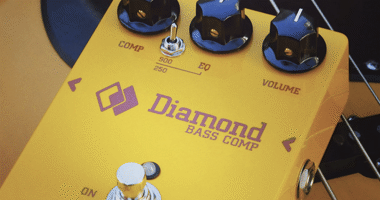 There are many amazing plug-ins out there and many will do just as good a job as any pedal, but maybe you have some special pedals that you have grown accustomed to and just want that particular sound. You can probably emulate it to a large degree with plug-ins, but you may also miss the last tiny details and character that makes all the difference. You can also tweak pedals in real-time during re-pedaling, which is much easier with physical knobs than with a mouse on a screen. Let’s assume you have a bass track that has already been recorded without any effects. 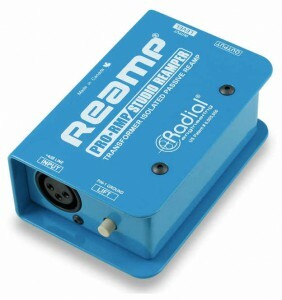 Now you need to insert a plug-in to select the particular output channel you have connected the REAMP device to. In this case, it would be Output 3. 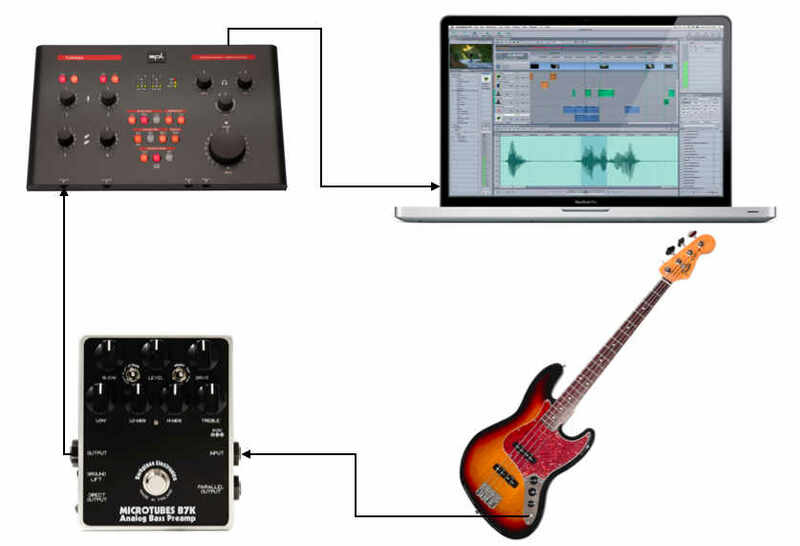 Then you connect the output of the REAMP device to one or more pedals and then pass the signal on to an input on your audio interface, create a new track in your DAW and select that input channel. You are now good to go and may record a new track with the sound of the pedal(s) you have inserted. There is really not much more to it than that. You will need to use an I/O distribution plug-in, but it is usually a part of the plug-in package that comes with most Digital Audio Workstations such as Logic Pro, Pro Tools, Cubase, etc. Now, you may have experienced at some point that using an effect often changes the way you play. 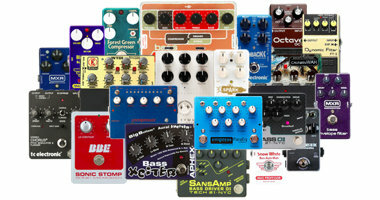 For instance, if you use compression the result that you hear might make you dig in harder than you usually would, or if you use an envelope filter wah, and octave or a drive pedal, chances are you actually play just a little bit differently than you would have done without the pedal(s). For that exact reason, I use a little trick when recording sound clips for the reviews if the pedal is changing the sound fundamentally. I simply use a stereo pedal and record two tracks simultaneously. Notice how the volume of the DRY track has been turned all the way down. This way, you will only hear the effect signal and play accordingly. In this example, you can see how the wave forms on the tracks are quite different. The Darkglass B7K (and other drive pedals) tend to also compress the sound a bit when you use a lot of gain. To wrap it all up, let’s take a quick listen to an example. 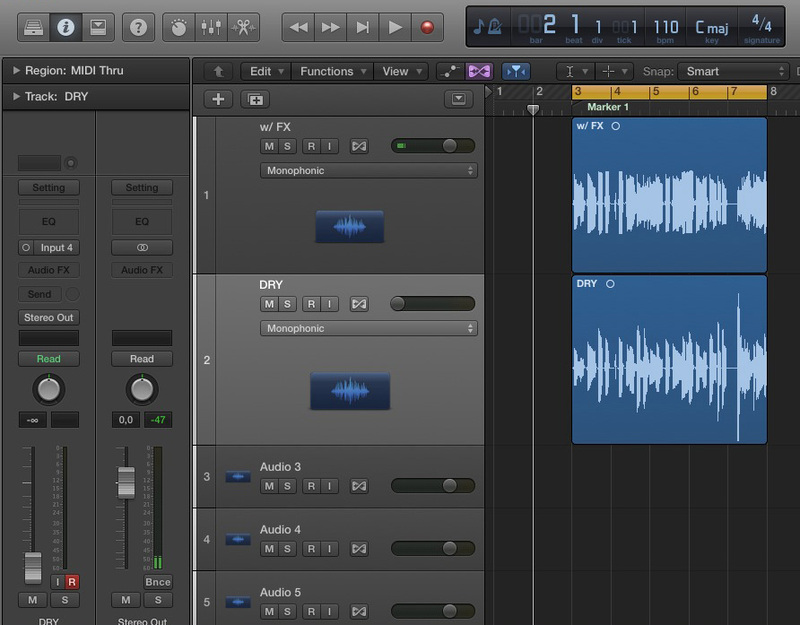 These two sound clips are from the same basic take, but split into two tracks as described in the above. If the sound was meant to be clean, I would have redone it to get more even dynamics, but as you can hear on the RE-FX take the B7K drive pedal adds some natural compression – and that was the sound I was listening to while recording. 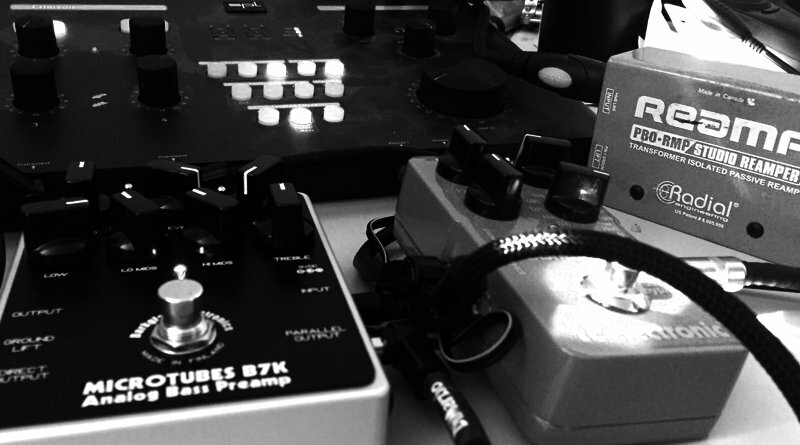 Now, with the DRY track, I can pass it through the B7K again if I want to tweak some alternative tones out of it – or any other pedal or piece of outboard gear for that matter.